So wrote William Jones in November 1865 in a letter sent from eastern Patagonia to his family in Bala, north Wales. Around six months earlier Jones had left Liverpool, England, sailing on the Mimosa into the Irish Sea and then the vast expanses of the Atlantic Ocean with around 150 other Welsh men, women and children. With financial backing from a Welsh emigration committee, and the blessing of the fledgling Argentine government, the intention was to establish a new settlement in the largely unmapped Patagonian region. In late July 1865, the emigrants finally reached the Patagonian coastline, disembarking at a location in present-day Puerto Madryn. 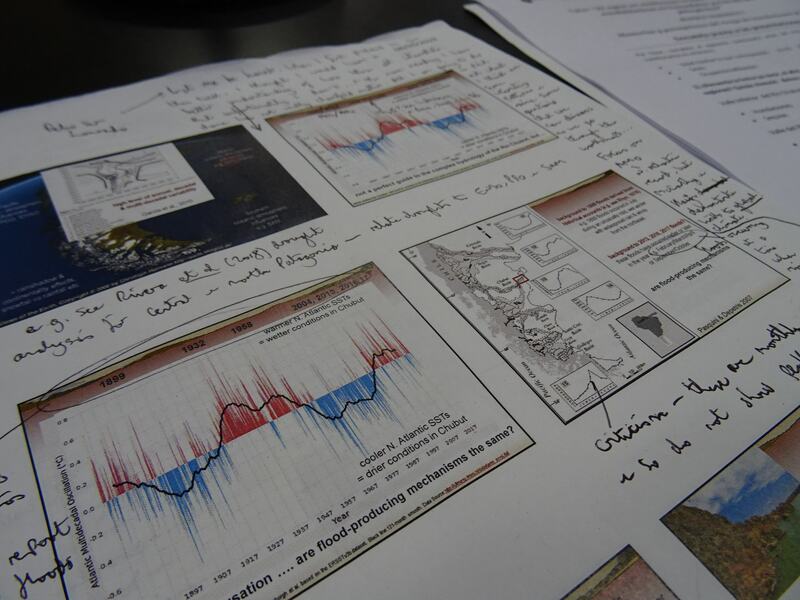 Having endured considerable hardships during the first few months, in his letter Jones was comparing the rainfall in eastern Patagonia (mean annual rainfall about 200 mm) to the more familiar quantities in Bala (mean annual rainfall about 1000 mm). The lack of regular, extended rainfall in eastern Patagonia came as a great disappointment to the new arrivals, who had been lured from their old homeland with the promise of abundant water and plentiful pastures. But mean annual rainfall figures can be deceptive, and even arid regions can receive heavy bursts of rain every once in a while. And when these bursts come, they can be very heavy indeed, with totals that sometimes exceed 100 mm in 24 hours. In later months and years, Jones and the other Welsh settlers no doubt would have experienced some heavier rainfalls in their new homeland, as would their descendants. 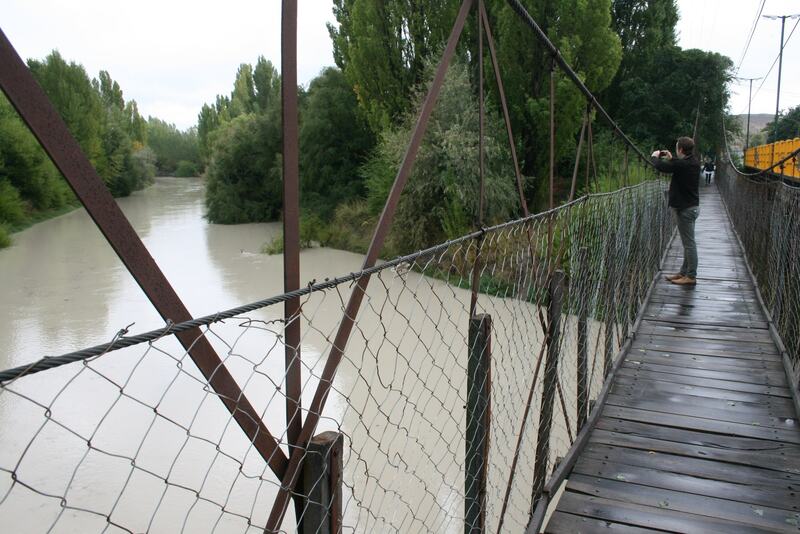 Indeed, in the last few years, extreme rainfall has led to widespread flooding in many parts of Patagonia, including in the still sparsely populated central regions of Chubut Province and the main population centres in the east (Puerto Madryn, Gaiman, Trelew, Rawson, Comodoro Rivadavia). Extreme rainfall and flooding can have negative consequences, including severe erosion and sedimentation, both of which may pose threats to infrastructure and personal property. 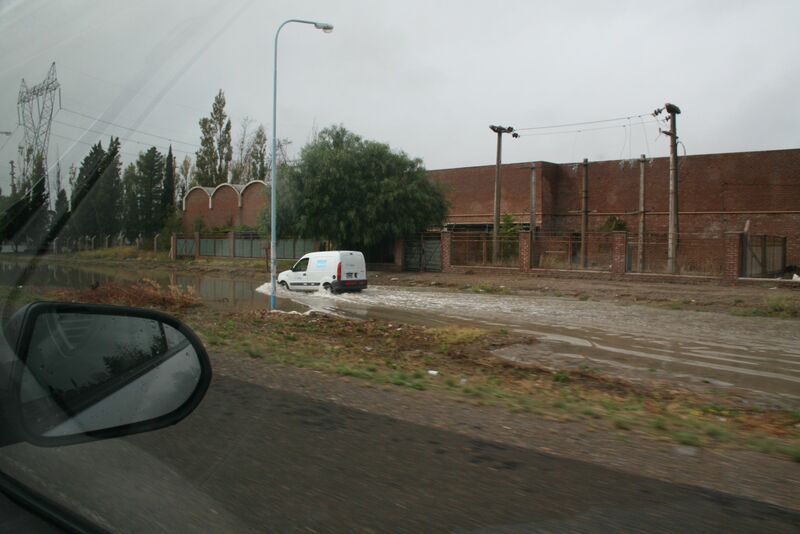 On 21st January 2016, for instance, nearly 70 mm of rain fell in Puerto Madryn in just 4 hours, leading to widespread flooding and damage to streets, houses, and industrial and commercial properties. But rainfall and flooding can also be beneficial, even essential, for they can help to replenish groundwater and reservoir supplies, and provide the lifeblood for desert ecosystems. Even in normally arid Patagonia, a variety of rivers, wetlands, shallow lakes and springs abound: wet places in a dry land. 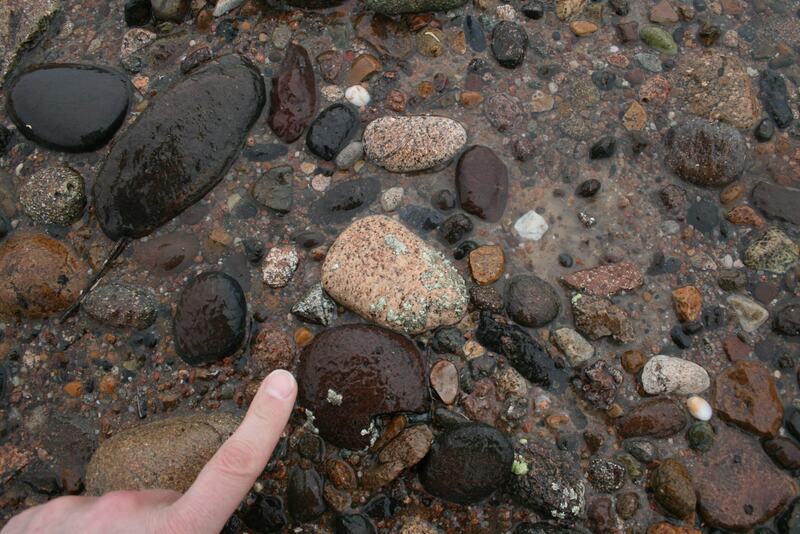 These wet places – only temporarily wet though many may be – provide a variety of ecosystem services, including water and food supply, promotion of biodiversity, and provision of recreational opportunities. In fact, in otherwise dry lands, the importance of these wet places as delivers of ecosystem service may be disproportionately important. Nonetheless, as previous blog posts have commented (e.g. see https://stephentooth.wordpress.com/2017/08/03/453/ and https://stephentooth.wordpress.com/2014/11/17/wetlands-in-drylands-how-good-is-the-service/), these ecosystem services are commonly unrecognised or underappreciated, and certainly are rarely managed for optimal or sustainable service delivery. So how do we go about changing this state of affairs? Providing opportunities for knowledge exchange activities among different interest groups – academics, university students, policy makers, engineers, local communities, school children, and so on – is a good start. 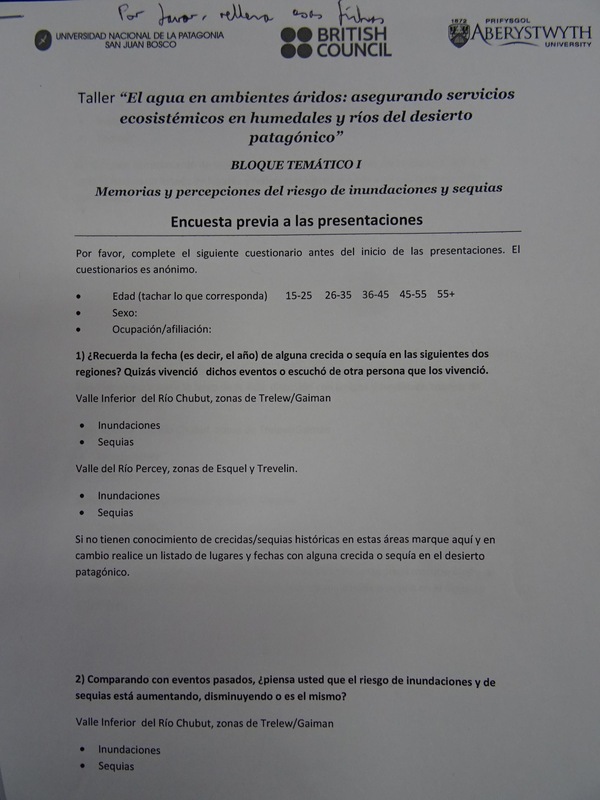 And on the back of previous work in Argentina (see https://stephentooth.wordpress.com/2014/01/06/a-potted-summary/) and other lines of research, Hywel Griffiths, myself and Gabriel Kaless from La Universidad National de La Patagonia San Juan Bosco (UNPSJB) were able to secure funding for a project through the British Council Higher Education Links Grants scheme. 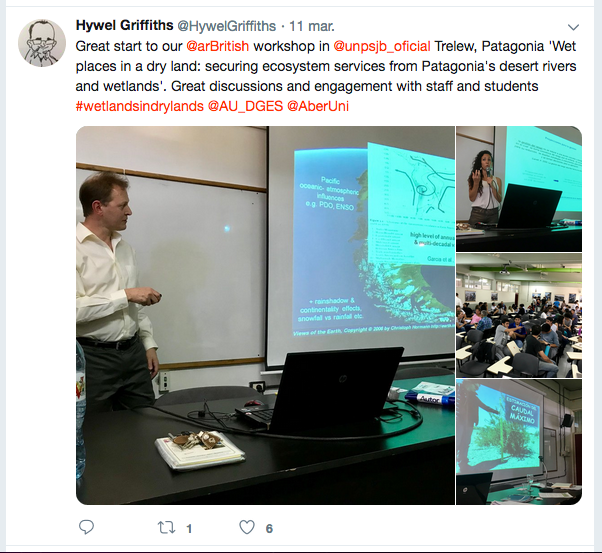 Entitled ‘Wet Places in a Dry Land: Securing Ecosystem Services from Patagonia’s Desert Rivers and Wetlands’, the project funding enabled Hywel and I to visit Patagonia in March 2019 to help run a series of workshops that would include many of the aforementioned interest groups. Coincidentally, and somewhat ironically, the timing of the trip also enabled us to avoid most of a spell of bad weather in Wales but instead experience first hand the capricious nature of the Patagonian weather. It all started well enough. The Saturday morning replacement bus/train journey from Aberystwyth to Birmingham airport was uneventful, and the Birmingham-Frankfurt and Frankfurt-Buenos Aires flights were bearable and on time. Our baggage arrived in Buenos Aires, and arrived intact. The transfer across Buenos Aires to the domestic airport was done in record time thanks to quiet Sunday morning traffic. For once, even the two hour flight south to Trelew left on time. 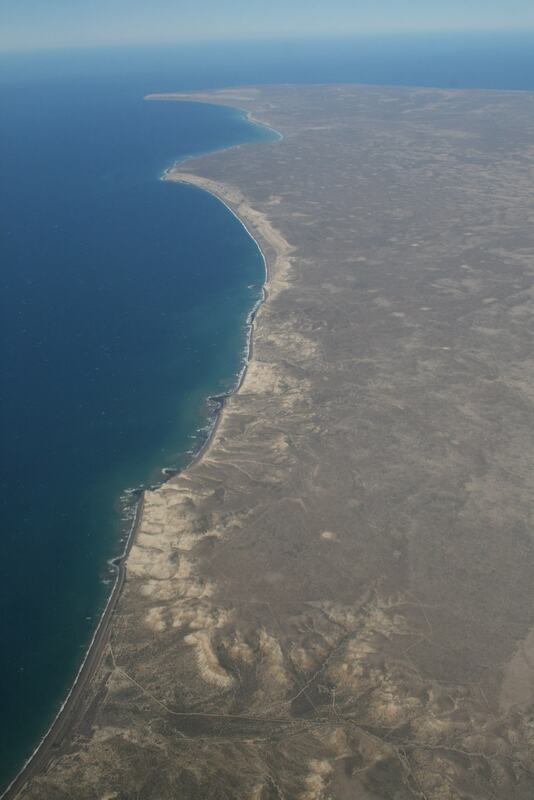 A window seat enabled us to see first hand the aridity of the eastern Patagonian coastal regions, and we marvelled at the hardiness of the early Welsh settlers, many of whom trekked 40 miles south from their point of initial disembarkation to the lower Chubut valley in order to establish the first settlement. The flight to Trelew landed on time, and again our baggage was there. Thankfully, we were at the front of the queue for car hire and despite the usual comedy routine of communications about just what was, and what was not, included in our reservation and just why our credit card details needed to taken, we left the airport swiftly. Given the various mishaps and near-disasters that had dogged various stages of travel in our previous visits to Argentina (for example, see https://stephentooth.wordpress.com/2014/01/11/a-change-of-fortune-and-a-change-of-clothes/), we also left the airport relieved. A half hour drive west and we were at a house in Gaiman, our temporary base for the next week. Tea and cakes with the owner of our house were followed by a short sleep and shower, both essential for freshening up prior to our first meeting in person with Gabriel. First impressions confirmed what could be gleaned from the previous skype meetings and numerous email exchanges: here was someone who recognized the opportunity provided by the British Council scheme and who had also been working hard to make the workshops a success. 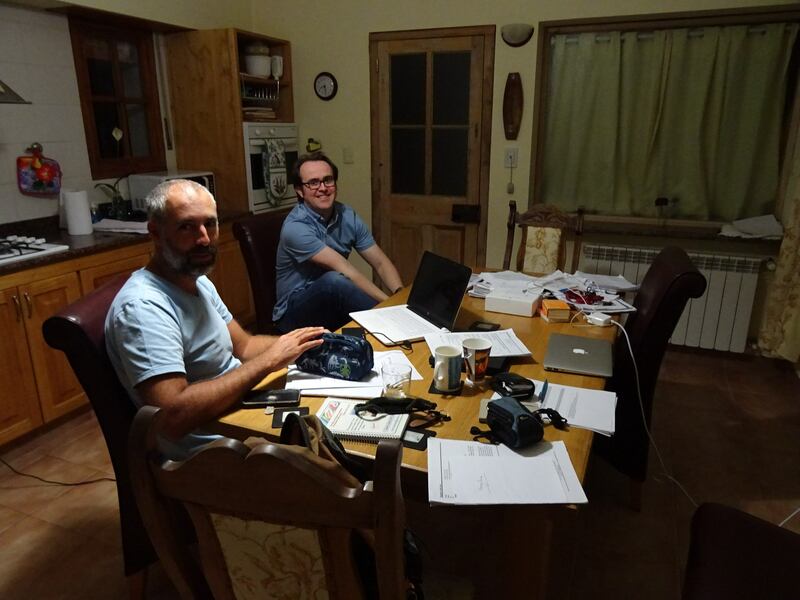 We got straight to work with further planning for the week’s activities, and on a breezy night, continued discussions over a meal of milanesa and Patagonian beer in a local eatery. 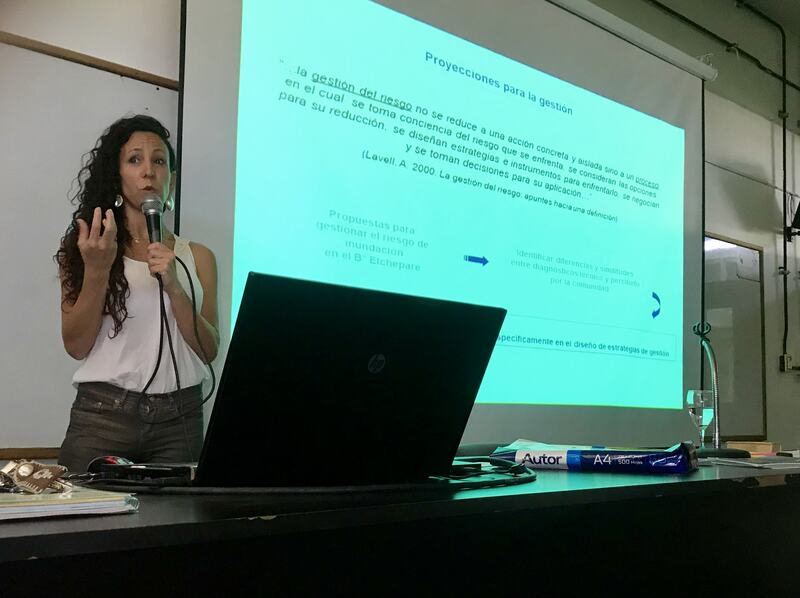 Monday’s activities took place at the Trelew campus of UNPSJB, where there was a mixed audience of around 70 academics, students, representatives of government and other decision-making authorities, and other professionals. 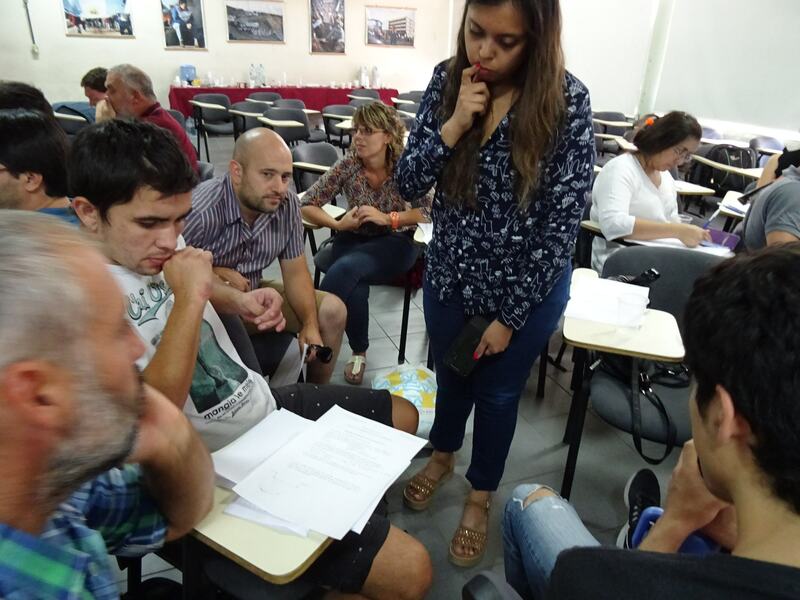 Before the start of our workshop, we had some hurried meetings with our translator (English-Spanish, Spanish-English), as we knew that she would be essential for ensuring smooth dialogue. Thankfully, email exchanges beforehand had answered most of her and our questions, and we were ready to go. In a room that seemed to get hotter with every minute thanks to the healthy attendance and the sun that blazed through the single-paned windows onto the blinds, the morning theme focused on flood risk and perceptions. Opening presentations were given by Hywel and myself on flood memories and adaptations among the early Welsh settlers and their descendants, and were followed by presentations by local Argentine researchers on the common mismatch between technical assessments and social perceptions of urban flood and mudflow hazards. The afternoon theme focused on desert and semi-desert rivers and wetlands and involved a presentation by myself and Hywel that provided a global perspective on these wet places in a dry land, and one by Gabriel and colleagues on the measurement, recording and impacts of extreme rainfall and flood events. Following each set of presentations, there was lots of engaged, rapid discussion in Spanish among the audience, both in the smaller breakout group activities and the ensuing plenary discussions. Plenary discussions were chaired by Gabriel, with the translator helping Hywel and I to keep track of the key points, and it was clear that there was plenty of interest in the Welsh settlement history and the unique historical perspective that this brings to the analysis of environmental change in the Patagonian environment. 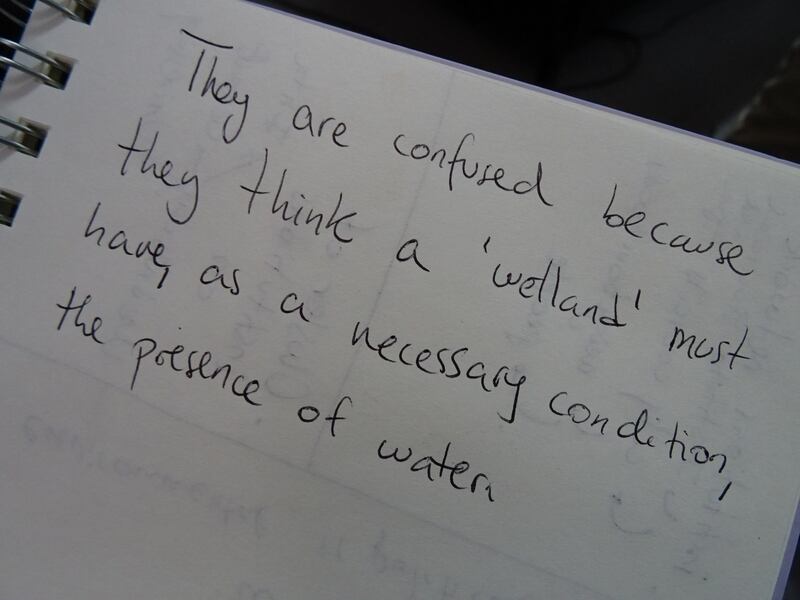 Furthermore, despite some confusion over the very concept of a wetland in a dryland – a confusion that Gabriel later admitted might have been due to the choice of word ‘humedal’ as a translation of wetland – there was obvious interest in developing more of a Patagonian perspective on desert and semi-desert wetlands. 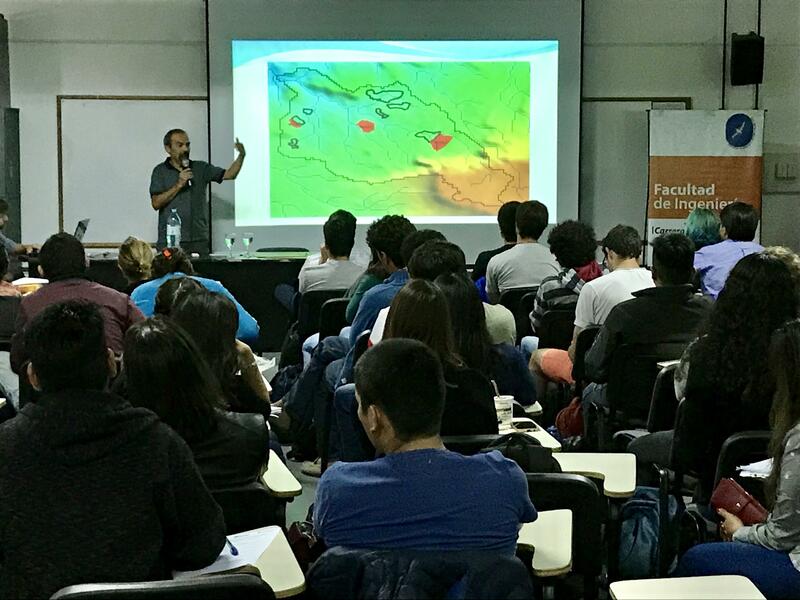 Tuesday’s activities took place at El Centro Nacional Patagónico (CONICET-CENPAT) in Puerto Madryn, located about 1.5 hours drive from Gaiman. 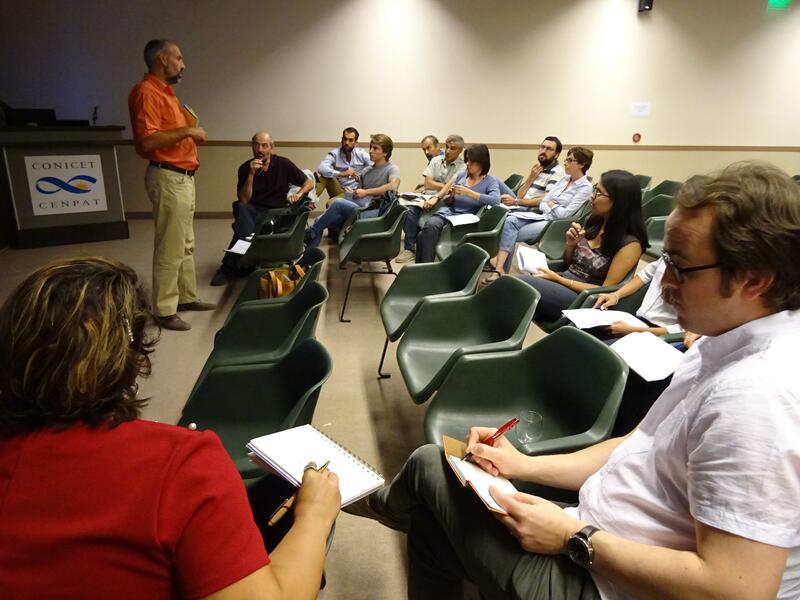 The location had been chosen specifically to ensure wider engagement with academics and researchers based in the city, and around 25 people were present. 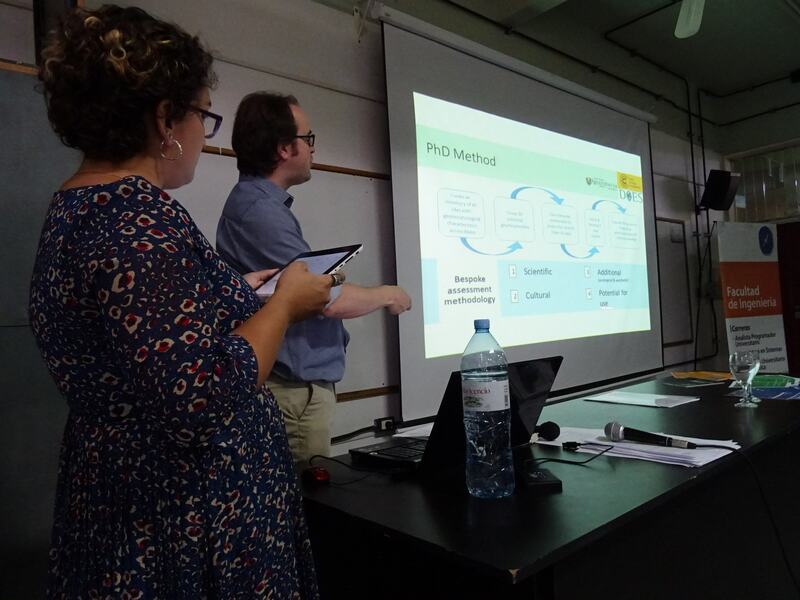 The format was essentially a repeat of the previous day’s presentations, activities and discussions, but the smaller, more specialist audience helped to bring a more technical, research-led perspective on discussions. While many similar issues were aired – particularly the complex definition of wetlands in drylands – others were given more prominence than on the previous day, such as the importance and challenges of communicating the science of rivers, wetlands and ecosystem services to different interest groups, and the potential strategies for doing so. El Centro Nacional Patagónico is located just a short distance from where the first contingent of Welsh emigrants set foot on the Patagonian shore. On a warm and sunny yet breezy day, Hywel and I took advantage of the generous lunch break to walk to the shore, where we tried to imagine the first thoughts of those emigrants as they contemplated their new home. At the end of the day, in the setting sun and enveloping dusk, we also did a quick tour of the various monuments to the Welsh settlers that are dotted along the Puerto Madryn seafront, some of which rightfully acknowledge the role played by the native peoples in helping the fledgling settlements. And thanks to CENPAT’s generosity, we were then treated to a meal in a local seafood restaurant. In setting out for the 1.5 hour drive back to Gaiman, we ran into the inevitable late night police roadblock on the outskirts of town, but luckily our immaculate paperwork and knowledge of the Welsh footballer Gareth Bale smoothed the potentially awkward conversation, and the delay was only minor. 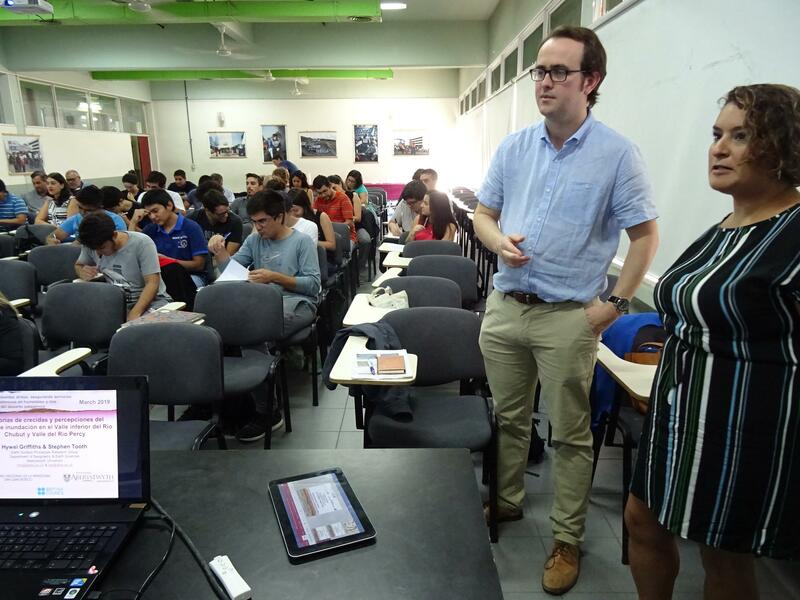 Wednesday’s activities again took place at the Trelew campus of UNPSJB. Again, there was a mixed audience of about 70 people but today the room was much cooler thanks to cloud cover and periodic burst of rains. While the coolness was welcome, the rain provided a portent of things to come. This day’s theme was different yet complementary to those on previous days, focusing more explicitly on ecosystem services. 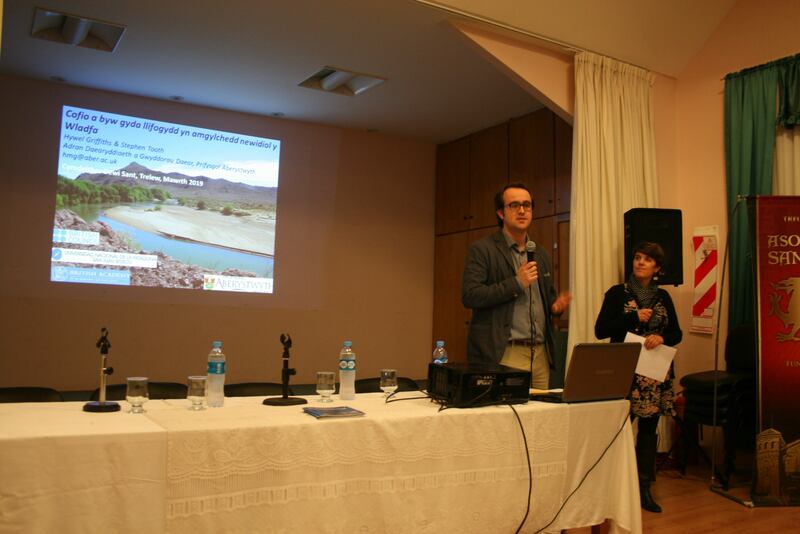 Presentations were given by CENPAT and UNPSJB researchers on aspects of ecosystem service delivery and landscape restoration approaches in the lower Chubut River valley, while a presentation by Hywel and myself highlighted how geotourism can tap the often underappreciated cultural ecosystem services. Just before our presentation, we had been whisked away to a noisy corridor to give an interview to a local TV network about the workshops and its intentions. While the interview went well, it was brief, and plans were made for a more extended interview the next day at the network’s station. 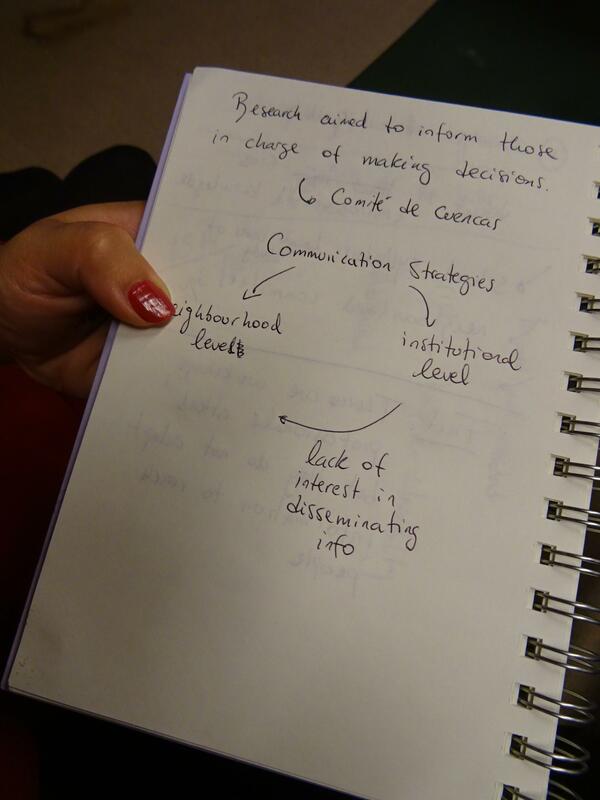 After our presentation, breakout group activities and a plenary discussion took place. As with the previous days’ discussions, I found it hard to follow everything that was said: my understanding of rapidly spoken Spanish is just not up to the task. But I had quickly realised that this was not the point anyway. Instead, it mattered more that discussions had been generated amongst a cross section of people who live and work in Patagonia, and who need to be engaged with the issues. And even with a partial understanding, and the translator’s summary of the main points, we got the feeling that the relatively unknown topic of geotourism had created a genuine buzz amongst many of those present, with positive feedback being given to our presentation and several useful contacts for potential future projects being made. Hywel presenting some of Sioned Llywelyn’s PhD findings: can approaches to geotourism developed in Wales be applied in the Patagonian context? 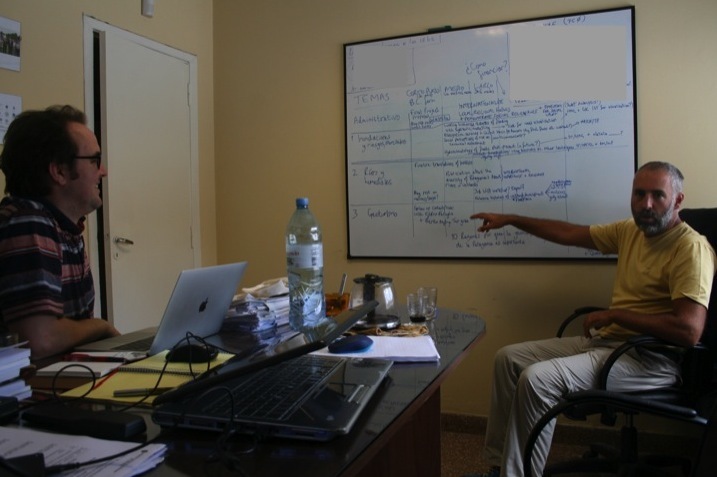 Wednesday lunchtime and afternoon provided a chance to start fleshing out the details of the numerous possible future collaborative projects, identification of which is a key requirement of the British Council scheme. Luckily, there was no shortage of enthusiasm, more a need for prioritisation and logical sequencing of projects, especially bearing in mind the necessity for additional funding. Wednesday evening involved a presentation by Hywel (in Welsh, with Spanish translation) to the Welsh Association of Trelew San David. A tremendous electrical storm that was breaking in the valley around the time of the presentation had kept a few potential attendees away but added a tinge of excitement to proceedings. The presentation provided lots of scope for discussion among the local Welsh-speaking community, some of whom are descended from the early settlers, particularly as we were able to report a summary of our findings from our previous project undertaken in early 2014. After the presentation had finished, we heeded reports of a power cut in Gaiman that had resulted from the storm. 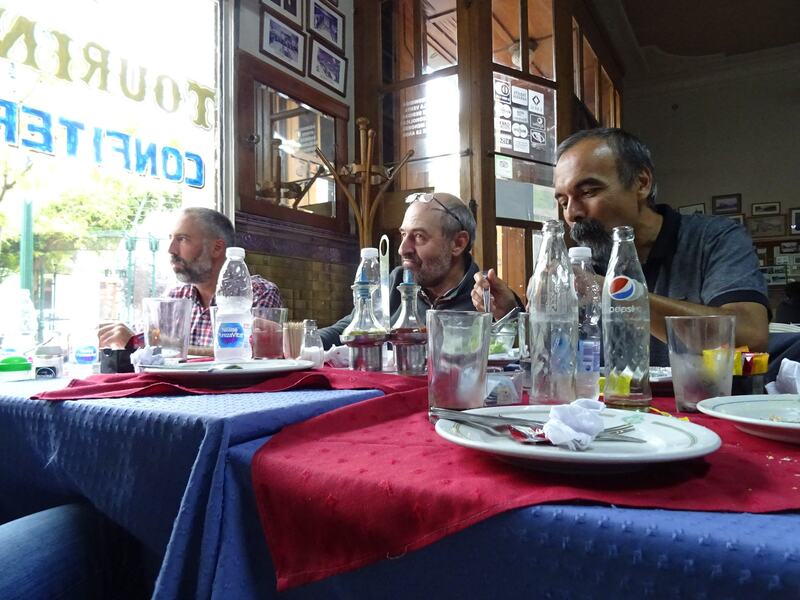 As such, we stayed in Trelew with some people from the presentation, enjoying food and a drink in a restaurant despite the continuous heavy rain that ensured a steady drip of water through parts of the roof. We returned to Gaiman late in the evening, finding in the still incessant rain that the electricity was still out in much of the town. In the morning, still there was no power and the rain continued. We headed into Trelew for a meeting with Gabriel who would take us to the intended interview at the TV station, but a power cut there had meant that this had to be cancelled. 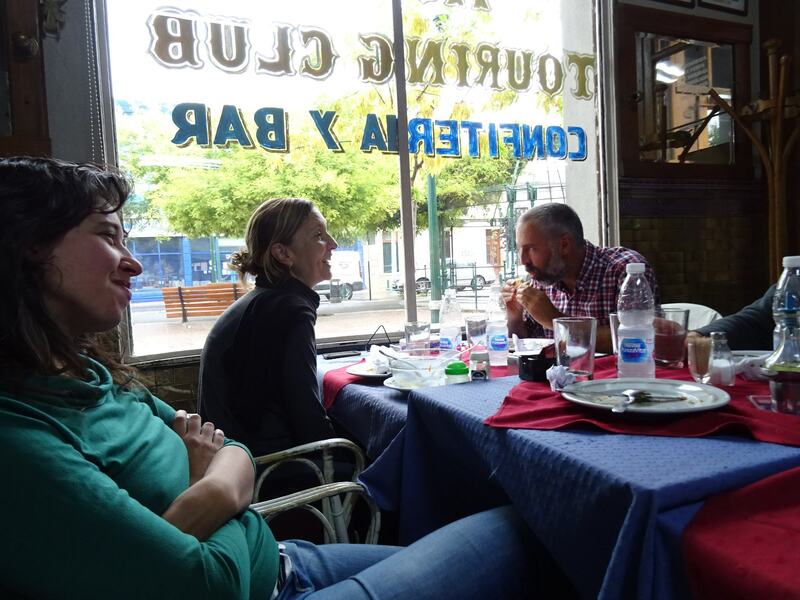 This news came too late for our translator who had travelled all the way down from Puerto Madryn, but we made good use of a meeting in a local café with a review of the previous day’s activities and plans for future projects. 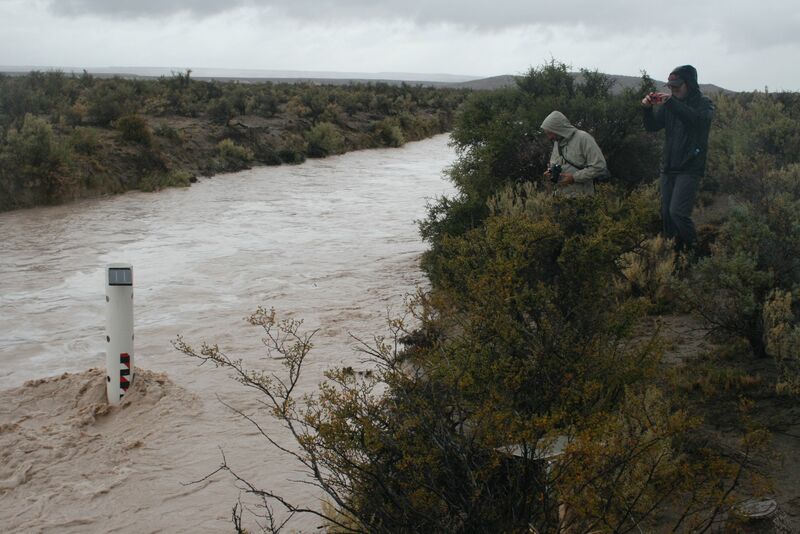 The rain had raised some uncertainty over whether our initial plans for a trip to stream gauging sites located in the Patagonian desert should go ahead. 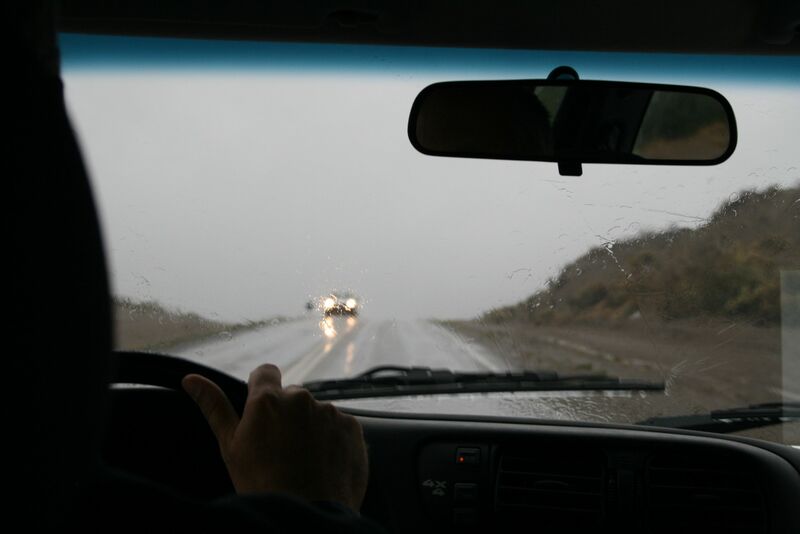 Heavy rain can make the dirt tracks in the desert tough going or impassable. But with the rain seemingly easing, we decided to go for it. 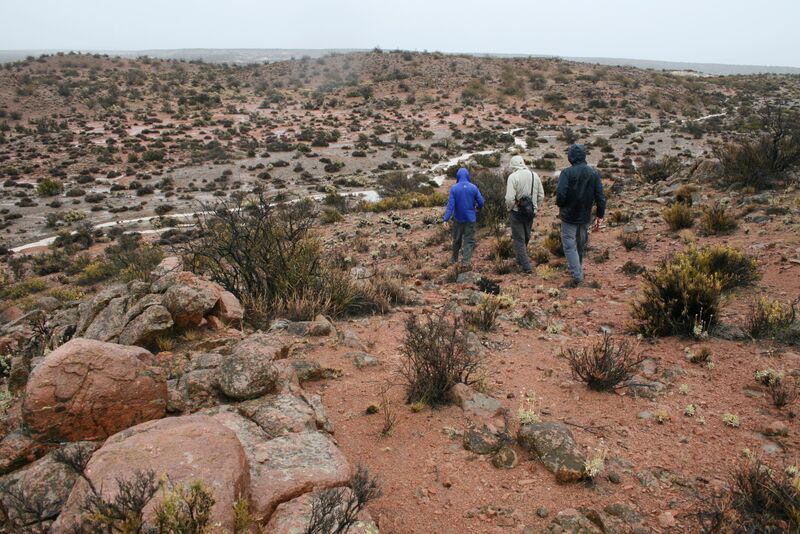 Travelling up the north side of the lower Chubut valley by tarred road, then crossing the irrigated floodplain and river onto the dirt tracks on the south side of the valley, after about an hour we found ourselves passing through increasingly more rugged terrain. Some very heavy bursts of rain continued, but having got this far, we were not going to be deterred. 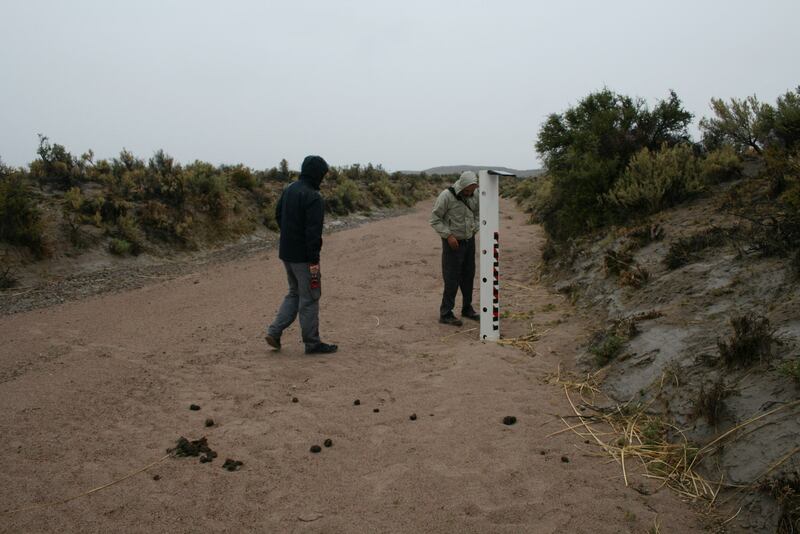 Our first visit was to a stream gauging station located along one of the numerous normally dry creeks that dissects the desert margins of the valley on its course to the permanently-flowing Chubut River. Since starting my PhD studies in Australia just over 26 ago, I have spent many hours wandering up and down similar creeks – technically known as ephemeral rivers – in various parts of the world, yet had never witnessed any actually flowing. And I’ll admit that I was a little disappointed when even the heavy rain seemed to do no more than simply dampen the sandy bed. Just what sort of rainfall does it take to get these creeks to actually carry flow? But as we drove around other parts of the desert, it became obvious that on the usually sun-baked surfaces above the rivers, water was starting to pool or be shed downslope, while smaller creeks were starting to carry flow. We walked across rugged hillsides to larger creeks, many of which were also now starting to flow, and flow more forcefully. 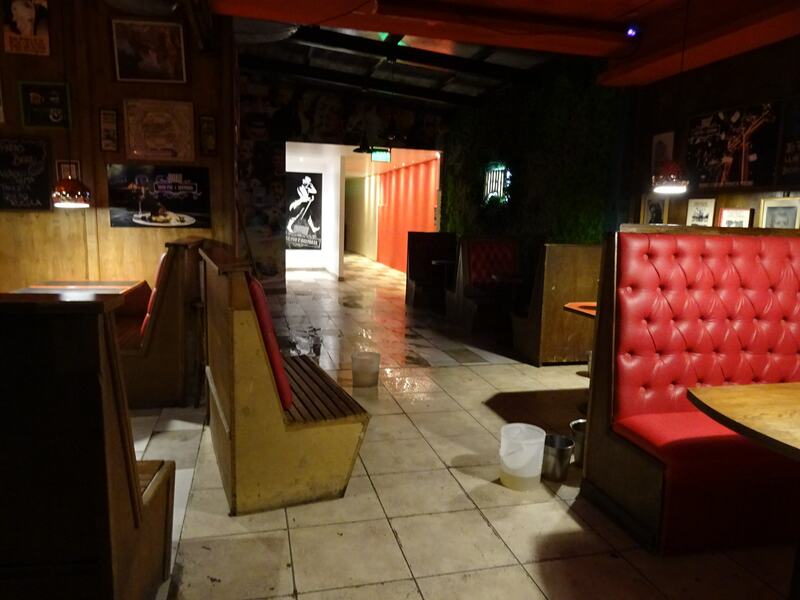 We were wet through but hey, ‘merece la pena’ … it was worthwhile. Finally, I would have my own photos and videos of a water-activated desert to use in future presentations. But after a few hours, we were all getting a bit cold, and it was time to head back to town for an evening parilla (barbeque). The desert had other ideas. As we returned to cross the previously dry creek with its gauging station, we found that a raging torrent now blocked our exit. With a depth of around 1 m and an estimated flow speed of about 2 m per second, this was far too dangerous to cross by vehicle, and we had no choice but to wait it out and hope that the water level would drop sufficiently in a couple of hours. We made good use of the delayed departure, visiting other flooded creeks to capture more footage. But as the day wore on, the rain continued in bursts, and the water level did not seem to be receding very fast, concern set in. Serious thoughts were being given to spending a night in a nearby house that formed part of a kaolin plant set in the desert, but with just what food provisions I didn’t dare ask. I was more concerned about the almost unthinkable possibilities of not being able to exit the desert even the next day and then missing our flight back to Buenos Aires. “Cuando en el desierto patagónico los arroyos braman” (“When the creeks roar in the Patagonian Desert”). So goes the title of an article written by Gabriel and colleagues. The creeks were roaring for sure, and I was doing some inner roaring of my own. Luckily, just when all seemed lost, at dusk the owner of the kaolin plant took us to the creek to assess the situation. It was still flowing, albeit slightly less deeply and swiftly than a hour or two beforehand. But it was enough to convince the plant owner that it was safe to cross, and without much warning he did just that, barreling through the turbid current and soft sandy bed to the drier, firmer gravel on the far side. With some trepidation, we followed, and also crossed safely. A slow journey at dusk then ensued along the rest of the dirt road, which now supported significant pools of water. But after dark, we finally reached the relative safety of the tarred road that runs along the more central and northern part of the lower Chubut valley, and we all breathed a collective sigh of relief. Eventually, we made back to Trelew and the parilla, tired but with a tale that will live long in the memory. After breakfast, we packed and left Gaiman, heading into Trelew for a meeting at the university with Gabriel and others to discuss future project proposals and British Council reporting requirements. 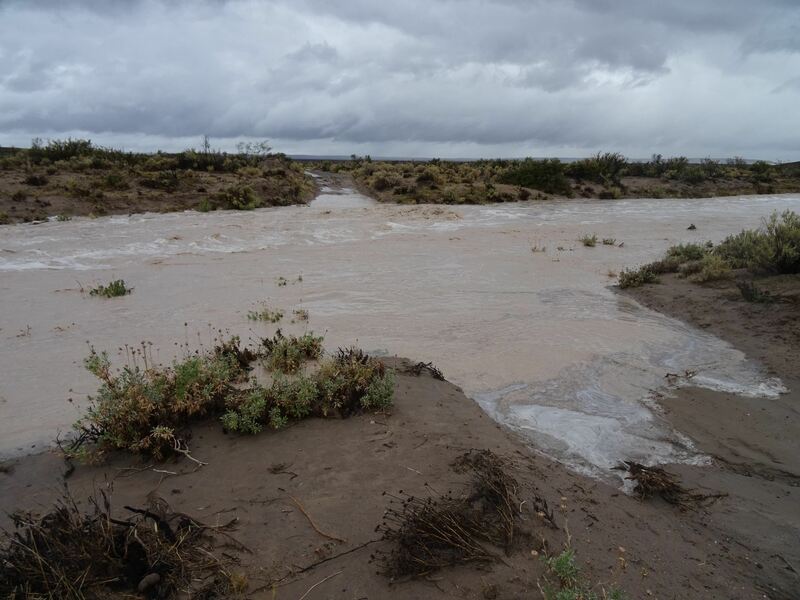 The rain was easing but in Gaiman the Chubut River had turned the colour of milky hot chocolate thanks to the sediment-laden runoff from the desert creeks that join the river farther upvalley, while in Trelew, large puddles occupied many of the side roads. 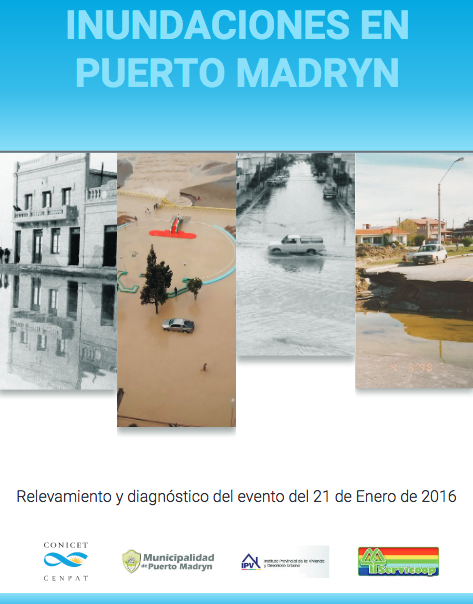 Reports were also being received of heavy rain and flooding in Puerto Madryn. While not on the scale of some previous rural and urban flood events that have impacted on this part of eastern Patagonia in recent years, the potential for the severe disruption that can result from rainfall and river flooding was abundantly clear. 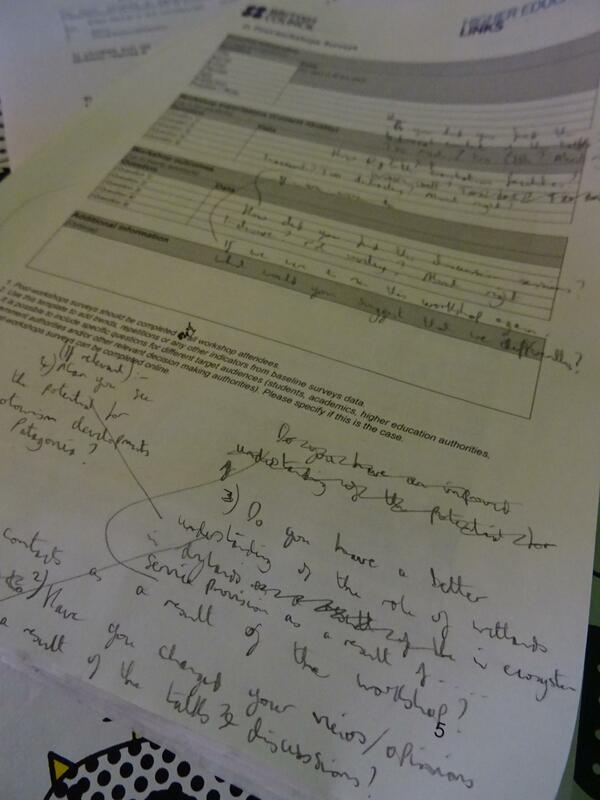 The discussions about future project proposals and reporting requirements were easy. 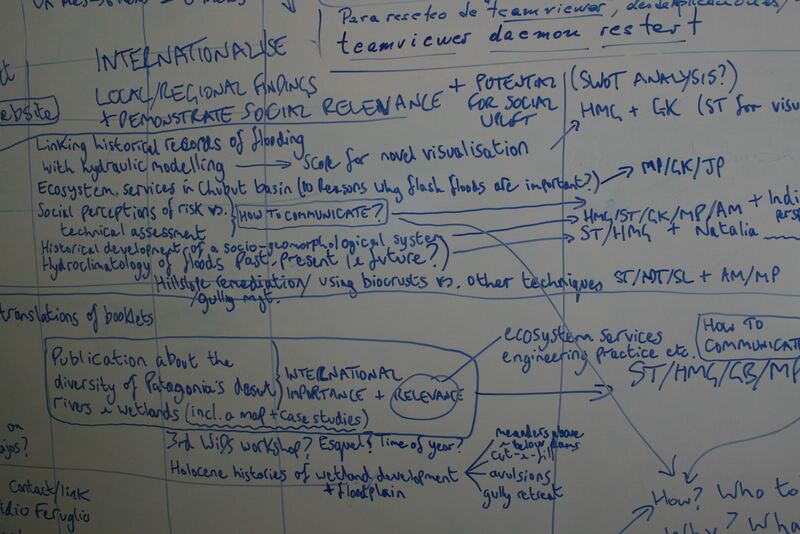 With no shortage of ideas, instead the difficulty was scribbling every idea into the available whiteboard space. We would have plenty to contemplate during our return trip and in the weeks and months to come. … but which ones to prioritise? As for the return trip …. one quick stop at a lifesize model of the world’s largest dinosaur (a 42 m long, 12 m tall titanosaur sauropod, located near Trelew airport) before we returned our hire car. One uneventful mid evening flight to Buenos Aires. One night in a very noisy downtown Buenos Aires hotel. One Sunday morning walk around the decaying streets of San Nicolás, Monserrat and San Telmo. As for the very turbulent, cramped flights to Frankfurt and Birmingham, the less said the better. The same goes for the expectedly awful train/replacement bus journey from the Birmingham Airport to a location close to Aberystwyth (note the emphasis on close to, but not actually to, Aberystwyth, thanks to rail engineering works and the seemingly little thought given to those who actually needed to reach the end of the line). But thanks to the generosity of a local friend who arranged to pick us up late at night, both Hywel and I got back to our respective homes just before midnight. 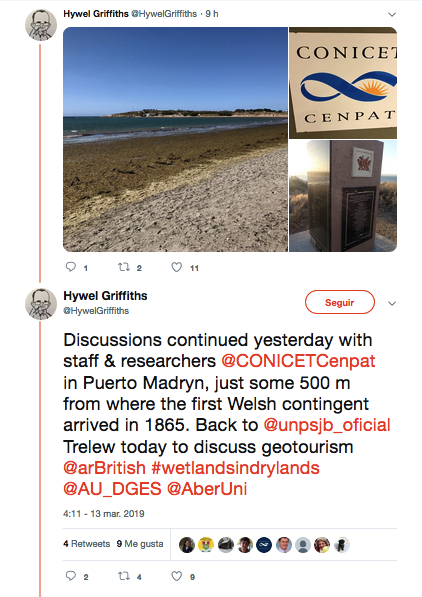 People sometimes question why academics at a Welsh university are doing geographical research in Argentine Patagonia. We typically counter by saying that despite the great distance between the two regions, we share some common history and have enduring cultural ties. But also relevant is that despite considerable differences in average climatic conditions, we also face many common environmental challenges, including dealing with extremes of rainfall, flood and drought, and ensuring wise use of the ecosystem services provided by rivers and wetlands. And to neatly illustrate this point, as we were leaving rain-soaked, partially flooded eastern Patagonia and making our journey back to Wales, we learnt of heavy rain in Bala and many other parts of Wales. 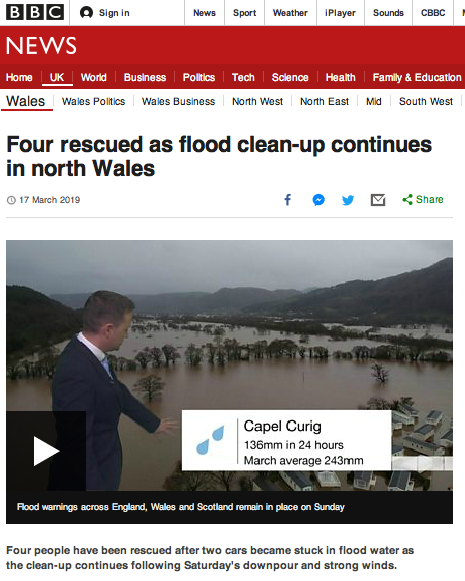 According to Natural Resources Wales, Capel Curig, located only about 30 miles by road from Bala, had received more than half a month’s worth of rain (136.6 mm) in 24 hours. The Conwy, the Dyfi, the Wye and many other rivers were in flood, with flood warnings issued for several towns (including Bala), while landslides had occurred in some steeper terrain, leading to severe disruption to rail and road transport. 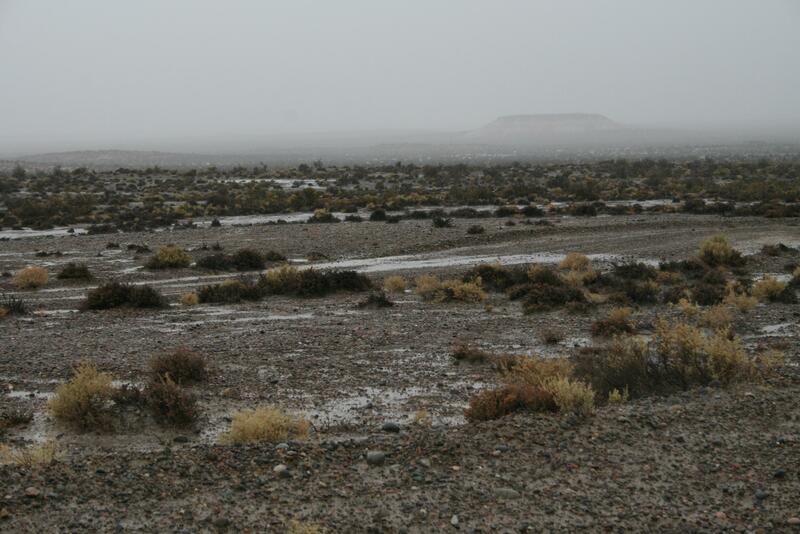 Meanwhile in parts of eastern Patagonia, the bad weather had also continued: we later heard that since Friday schools in parts of Puerto Madryn, Trelew and Rawson had been closed and many people had not had potable water in their houses. Under a warming, more variable climate, the overwhelming scientific consensus is that such weather extremes are likely to be more common in the years ahead, a situation that inevitably will influence the nature and quality of ecosystem service delivery and regularly test community and wider societal resilience. Significant challenges will be faced, to put it mildly. But through schemes that promote knowledge exchange between academics and other interested parties, such as those funded by the British Council, we are more likely to be able to identify strategies and solutions that will help us rise to such challenges. Posted on March 24, 2019 by stephentooth. This entry was posted in Uncategorized and tagged drylands, ecosystem services, extreme events, geomorphology, landscape change, wetlands. Bookmark the permalink. A glossary for the Anthropocene? 10 Reasons Why …. 10 Rheswm Pam ….